« Global Lives Project is coming to San Francisco State University! Pictured above (L to R): UC Berkeley Students, Lubna Sebastian and GIna Kotos, with UC Berkeley Exhibition Producer and Director, Daniel Chein. The CITRIS Tech Museum was created by the California legislature to present interdisciplinary research and innovation from many of the UC campuses. The museum brings together multiple disciplines to present solutions to sustainability, automation, healthcare, and more. With public and private partners, it aims to encourage civic engagement and global awareness. The Global Lives Project is a video library of the lives of 20 diverse people from around the world. It was created by the Global Lives Collective, a large group of volunteer photographers, videographers, translators, and people from around the world. The project brings experiences from all over the world into curated exhibits and an online video library. 24 hours of footage from each participant showcases the diversity of human experience across different cultures, ethnicities, and religions all over the globe. The Global Lives exhibit premiered at Lincoln Center for the New York Film Festival, and previously showed at the Berkeley Art Museum & Pacific Film Archive (BAMPFA). You can now find the exhibits at the Phoebe A. Hearst Museum of Anthropology and the Harvard Science Center, and later this year it will be shown at the Smithsonian. The exhibits aim to reach a diverse audience which includes students, faculty, and campus visitors to broaden their views of the human experience. The Global Lives Project is currently on exhibition in the CITRIS Tech Museum through May 2018; you can access this free exhibit Monday-Friday in Sutardja Dai Hall from 8:00am-4:30pm. 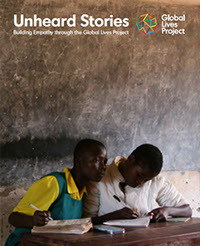 The Project offers a peek into the lives of ordinary people from all over the world, and aims to foster global empathy. In 2004, the Project was founded by UC Berkeley alumnus and faculty member, David Evan Harris, and in 2018 we are now delighted to present exhibitions at multiple locations throughout the UC Berkeley campus.